Situated in Davao City’s peaceful northern district, Hotel Tropika is fast becoming the hotel of choice for travelers looking to experience the best the city has to offer. True to its name, the hotel sits in the middle of a tropical setting, with lush greens providing a restful atmosphere. Hotel Tropika’s parking lot was scorching hot when we arrived at around 2PM. The first thing I noticed was the abundance of plants all around the area. It looked quite charming even in the glaring heat but I had to quickly ignore the view to seek refuge in their air-conditioned lobby. An equally charming receptionist greets everyone at the lobby. A number of Asian guests were relaxing in their plush seats, perhaps exhausted from exploring nearby attractions. One of the staff members was assigned to tour me around, which she did with enthusiasm. This is always a good sign; friendly hotel personnel almost always ensure an excellent stay. Hotel Tropika has 30 well-appointed guestrooms furnished with either a king-sized bed or twin beds made ultra-comfortable through premium linen. All rooms have flat-screen cable TV, complimentary WiFi Internet access, coffee maker, refrigerator, work desk, and hot and cold shower. The rooms are decorated in earth colors, adding to the tropical hideaway ambiance. Lantana Function Rooms open to an airy courtyard. This 3-star property is ideal not just for leisure travelers but for business travelers as well. 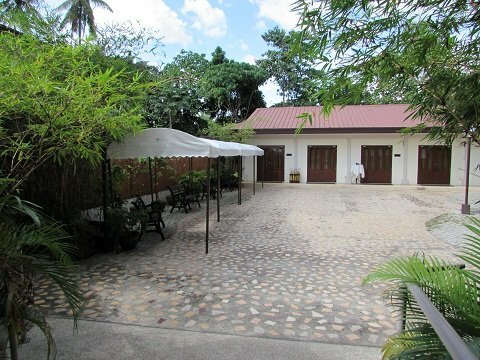 Hotel Tropika’s small courtyard leads to the Lantana Function Rooms where small business meetings and functions can be held comfortably. 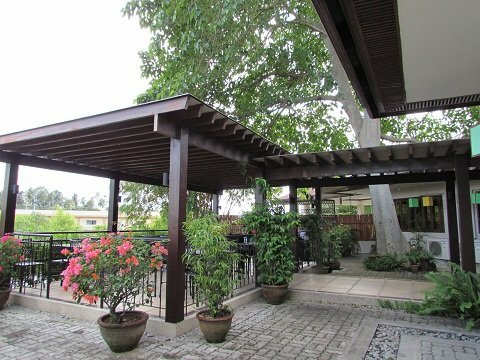 There are also larger conference/banquet areas for larger groups called Palmera, and outdoor function area ideal for informal gatherings called Ficus. A computer station is accessible at the hotel lobby. The hotel’s on-site restaurant, Café Aseya, serves excellent Filipino, Japanese, Vietnamese, and Thai fare. Guests may choose between the indoor dining room and the al-fresco setting where they can see the hotel’s lush garden. Room service is also available for those who wish to stay in. A swimming pool is currently under construction close to the garden and completion is expected to be within 2014. Cafe Aseya offers outdoor dining. 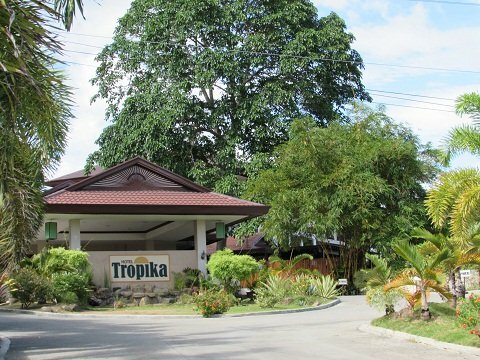 Hotel Tropika also provides tours within Davao City. Depending on what interests you, you may choose among the following tours, pick one or try them all! –Adventure Tour: Deca Wakeboard Park, Zipline, Japanese Tunnel, Crocodile Park, Jack’s Ridge and Davao City fruit stands. 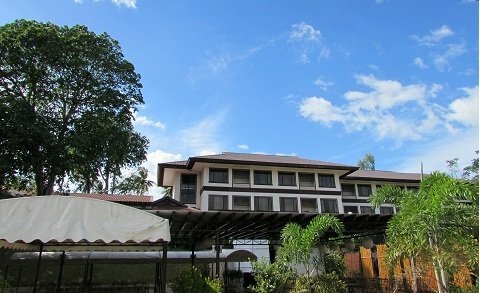 Hotel Tropika is located close to several attractions in Davao City. It is also less than 30 minutes from the airport. Nearby are jetty ports to the most popular resorts in Samal Island. Shopping and dining venues are also close by: DAMOSA Gateway and SM Lanang Premier are less than 10 minutes away. Just a few steps from the hotel entrance are a couple of spas for those who wish to pamper themselves. Hotel Tropika viewed from the garden. 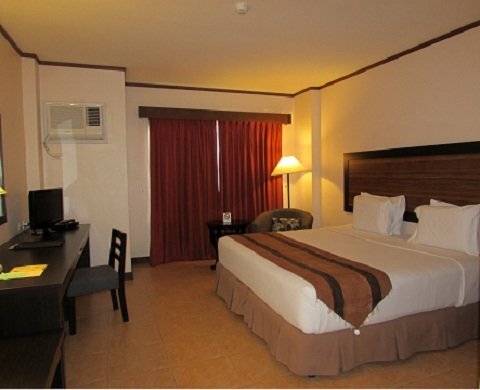 If you’re looking for a great value hotel for your stay in Davao City, Hotel Tropika is a perfect option. The hotel provides the much-needed peace and quiet without really taking you too far from everything that’s happening in the city and the neighboring Samal Island. All guestrooms at Hotel Tropika currently cost PhP3,400 (roughly USD$75) a night, a good value for the first-class amenities. Complimentary breakfast is included in the rate. However, from January-March 2014, the hotel offers discounted rates for all rooms: Php2700 (USD$60) for weekdays and PhP2,200 (USD$49) for weekends. Promo rates still include free breakfasts.